When the weather turns, and we layer on the heavier comforter, the last thing I ever want to do in the morning is toss off the blankets and let in the chilly air. But the secret to getting myself up in the morning? A warm breakfast that is going to fill me up. This Almond Milk Rice Pudding really hits the spot on the chillier days. If it can coax me out of bed at 6 AM, then surely it can get anyone out of bed. 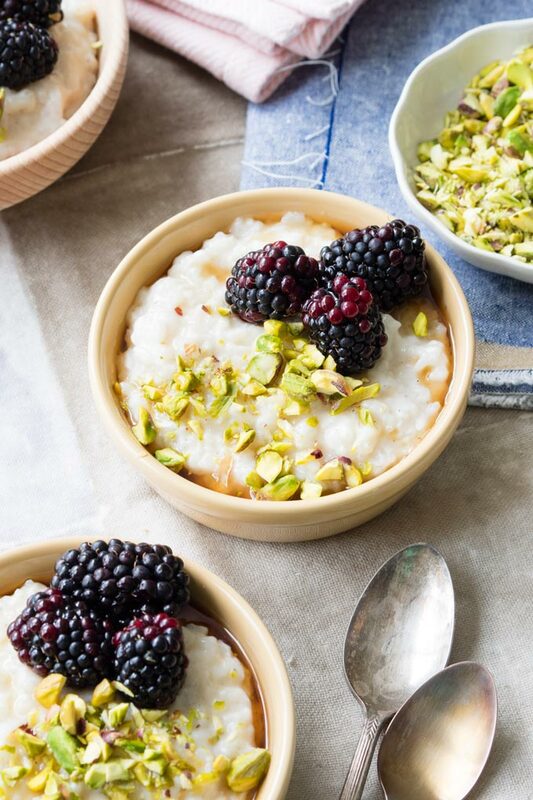 Serve it hot, and this Almond Milk Rice Pudding will warm you up right through. 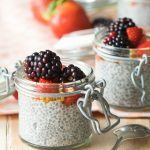 It reminds me a bit of eating oatmeal or porridge for breakfast, but only to the extent that it’s a comforting and warm breakfast that is also healthy, and you can chose your own toppings. That’s a lot of similarities, isn’t it? The main difference is that rice pudding is often served as a dessert. 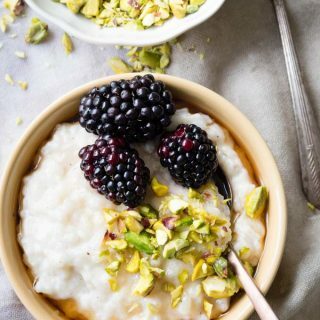 But if you tweak a traditional rice pudding recipe a little, like I did below, it’s a perfectly delicious breakfast that is also healthy. Beyond loving how this Almond Milk Rice Pudding tastes, there are so many healthy bits to it. Almond milk has no saturated fat or cholesterol, and has fewer calories than whole milk. You can buy fortified almond milk, so you are getting calcium, vitamins and other minerals. 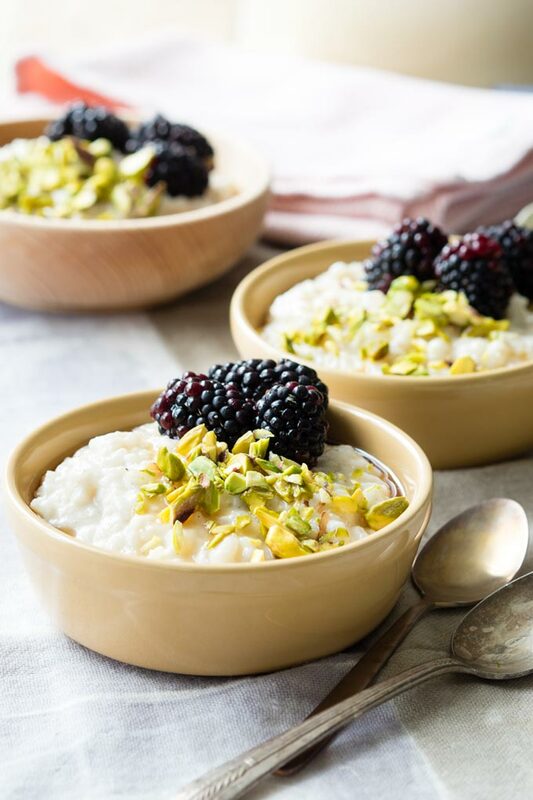 This almond milk rice pudding is only sweetened with maple syrup after cooking, and has no sugars added in when it is cooked. Therefore, you have complete control over how much sweetness you would like to add to it. 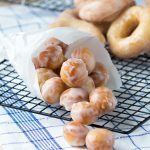 Use the maple syrup sparingly to keep it low sugar. Or sweeten it with only fresh fruit instead. I top it with fruit and pistachios, which are filled with essential nutrients and healthy fats. Pistachios also contain fewer calories and more potassium and vitamin K per serving than other nuts. You can top it with pistachios too, or any other nuts of your choice. This Almond Milk Rice Pudding also works well with a granola topping if you’re in a pinch. 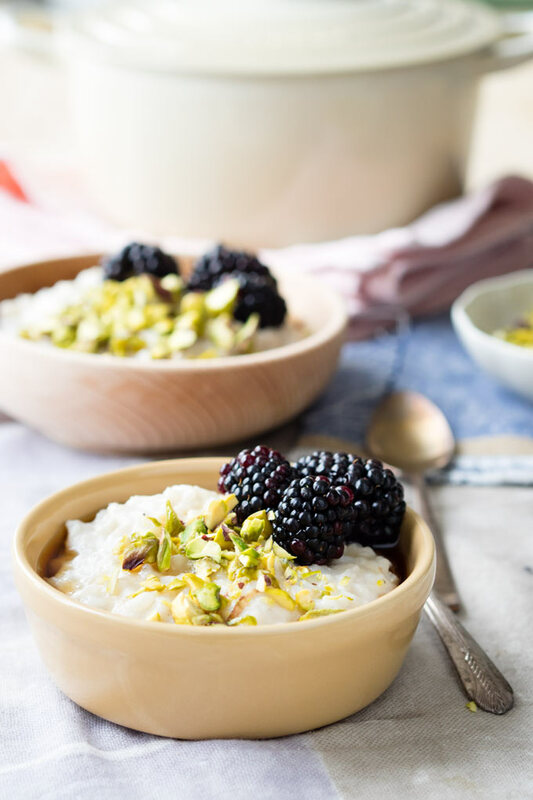 Unlike traditional rice pudding, this recipe for almond milk rice pudding is vegan and dairy free because it uses almond milk instead of cow’s milk. 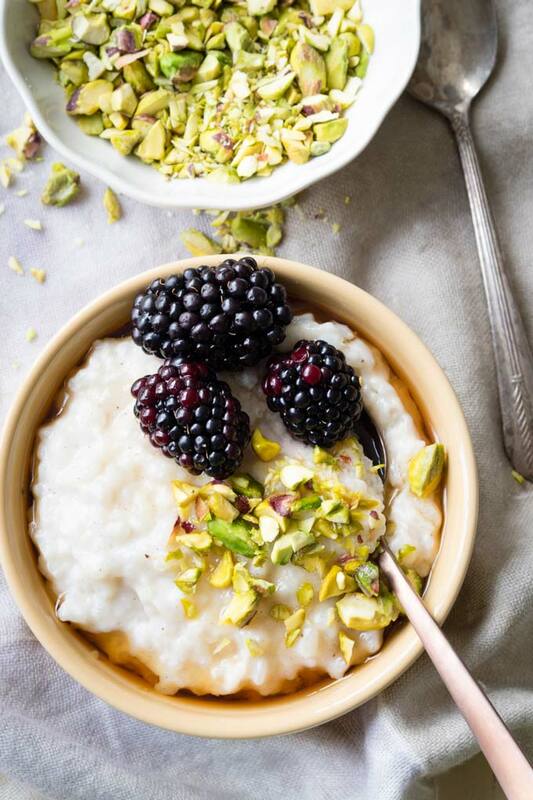 The almond milk gives the rice pudding a nutty taste that makes it perfect for breakfast. If you’re used to having rice pudding as a dessert, you might not find it as creamy as rice pudding made with whole milk, cream or coconut milk. But it’s plenty creamy, and the good news is that it is free from saturated fat, which you don’t get with the other milk options. To be honest, after trying rice pudding with almond milk, I prefer it to regular milk because it gives it a distinct nutty taste, and it makes the dish feel more suitable for a breakfast as opposed to a dessert. I was inspired to make this Almond Milk Rice Pudding after reading the Natural Food Kitchen by Jordan Bourke. It is a beautiful book that has recipes using alternative ingredients, rather than the traditional ingredients found in most recipes. 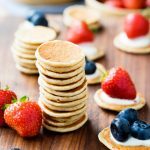 The book also does not include any recipes with refined sugar, but relies on other natural ingredients to add sweetness. 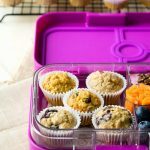 It’s an inspirational way of cooking and eating healthy. He doesn’t have an Almond Milk Rice Pudding recipe in it, but he does make a vegan rice pudding using both coconut milk and almond milk. 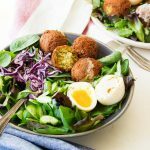 You can read my full review of the Natural Food Kitchen here: Cookbook Review: the Natural Food Kitchen by Jordan Bourke. Almond Milk Rice Pudding that is vegan and gluten free. A healthy low sugar breakfast made with almond milk and served with fresh fruit, pistachios and maple syrup. 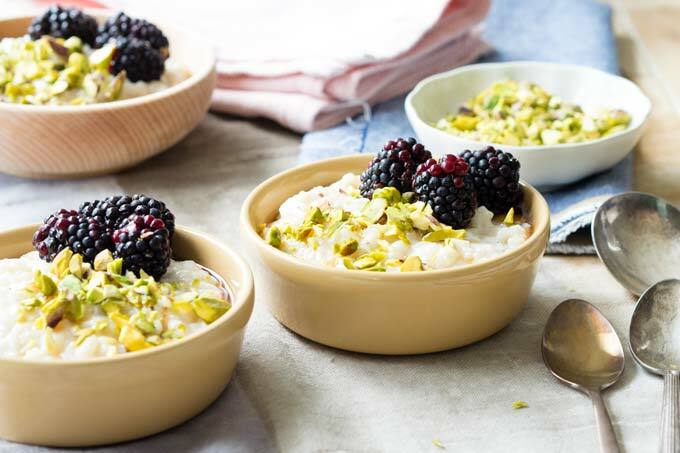 There is no sugar added to the base recipe, so you have complete control on how much maple syrup you would like to top it with, or leave it off and sweeten this rice pudding with just fresh fruit. Rinse the rice under running water until the water runs clear. Add rice and almond milk into a medium pot and bring to a boil. Reduce the heat to low, cover, and simmer for about 15 minutes, stirring occasionally to make sure the rice does not stick to the bottom of the pot. Uncover the pot, and continue to simmer for another 10-15 minutes, stirring the rice occasionally. The mixture will start out very watery, but the rice will slowly absorb all the liquid until it is thick and creamy. Once the rice is cooked through, stir in the almond extract, vanilla extract (if using), and salt. Cover and let rest for about 5 minutes. If the pudding is too think for your preference, stir in additional almond milk. Spoon into bowls, and add on the dates. Lightly drizzle maple syrup on top and sprinkle with cinnamon. You can make this Almond Milk Rice Pudding the night before and store it in the refrigerator in an air tight container. If you like it warm, simply heat it up on the stovetop or in the microwave in the morning. Otherwise it is delicious served cold too. Hi! Hope you’re still there Tina, I see the last post was in 2014! 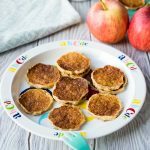 I am making this for my dairy free granddaughter who is 18 months old and I wondered if it is freezable? Hi Karen. 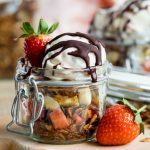 I’m here :) I’ve been posting frequently, just no comments have been left for this recipe in a long time. 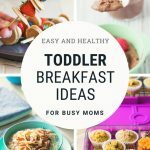 This is a great recipe for toddlers! I make it for mine too, and he loves it. In any event, I haven’t tried freezing this rice pudding before. Sorry I’m not much help. 1. I added 1/4 cup of agave right after uncovering, after the first 15 minutes of cooking. 2. Too much cinnamon. Next time I will only use 1/4 tsp. I hope that this helps others. Thanks for the tips and feedback! You can never have enough cinnamon!! 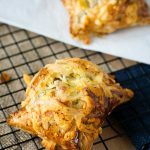 If this is anything as good as your Healthy Zuchini and Oatmeal muffins I’m sure I will definitely count myself lucky! I made the muffins this past weekend; substituted pecans for walnuts, greek yoghurt for the creme f.; didn’t want to make an extra trip to the market. Still came out YUM. This recipe will be great for a friend of mine who cannot tolerate milk so well anymore but still loves rice pudding. I’m sure this will make him happy. Thanks for sharing your “Cook top” inspirations. So happy to hear that the Zucchini Oat Muffins turned out well! Please do share if you make this almond milk rice pudding too! This looks amazing! I think I know what I am making for breakfast this weekend, served with a giant mug of chai. Congrats on your re-launch. I am excited to see more recipes for my favorite meal of the day. :) Yuuumm! Hope you love it!